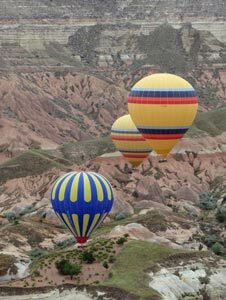 The rain on the roof of the pension woke us up at 2am and we looked at each other without saying anything – this morning we had booked a balloon flight over Cappadocia, one of the highest degrees of must-do events for tourists coming to this region. With 16 companies and over 120 balloons, this activity puts 30 million euro into the local economy annually. But maybe none from us this morning! By 5am, when we wandered over the road from our pension to the balloon company’s office, the rain was well gone, but the sky was cloudy and a light wind blew – well, it seemed light to us, but for the balloon pilots, it was verging on the unsafe. The flight was on, then off, then on again. 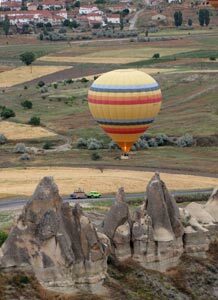 Quickly a column of mini-vans ferried the waiting people out to a launching field on the plateau high above the valleys of Göreme. 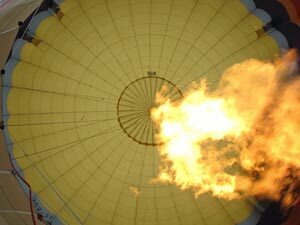 The balloons were being inflated as we arrived – 10 minutes later they were being deflated as the wind picked up – 15 minutes later, the flight was on again and the six colourful balloons were rising up and taking shape as hot air filled their interiors. All across the plateau this scene was being repeated by other ballooning companies. 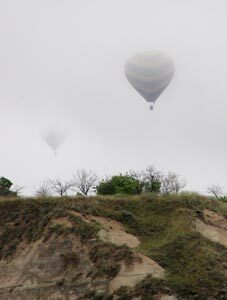 We quickly climbed into the basket of our balloon, along with 10 other passengers and our Ukrainian pilot (they come here from all over the world during the tourist season) and lifted off, ever so gently into the overcast sky. 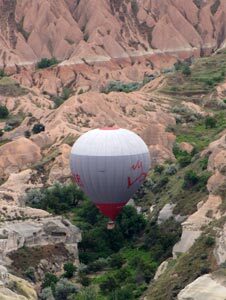 The balloon drifted slowly towards the edge of the plateau and suddenly the earth dropped away to reveal the valleys of Göreme with their strange rock formations beneath us – magnificent! 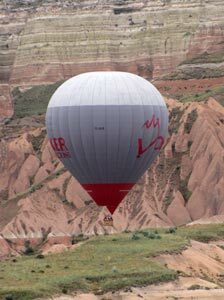 We drifted high over the fairy chimneys of Göreme towards the pastel landscapes of the Rose and Red Valleys, silent apart from the periodic blast of the burners, the sky ahead and behind, below and above, filled with balloons of diverse colour and pattern – a beautiful sight. Once over the valleys we dropped down to drift between formations before rising once again to search for a landing spot on the opposite plateau. 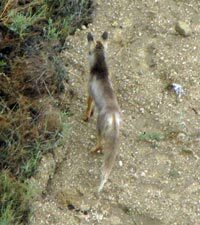 We had been aloft for well over an hour, but time seemed to stop during that time. All too soon we were back on the ground in a grassy field. 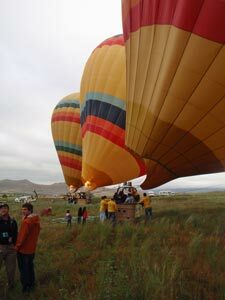 The pilot and ground-crew manipulated our balloon delicately onto the back of the trailer, and we clambered out to drink a glass of champagne to celebrate our flight. 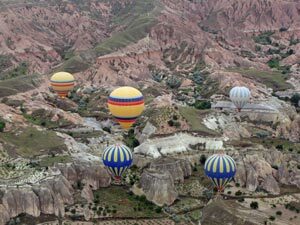 True, almost everyone who comes here takes a balloon flight, but it was a spectacular way to see the Cappadocian landscape. 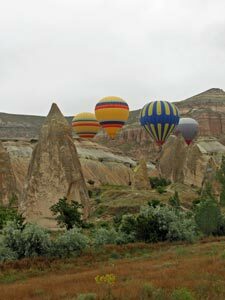 Even more so, as the fair Nello said, the best part is not so much what you see below, but just being part of this convoy of colourful balloons drifting silently through the cool Cappadocian air.